Almost every vegetable that that has been studied has been found to contain substances that benefit health, from the heart and blood, to countering the formation of tumors. Fresh vegetables, when cooked correctly and eaten with the right fats, are one of the best protections against disease. There are several broad categories of vegetables. First are the dark green, leafy vegetables, such as spinach and chard. These contain abundant vitamins and minerals, particularly B vitamins, calcium and trace minerals, and should be included in the diet on a regular basis. A second category is cruciferous vegetables, including cabbage, Brussels sprouts, broccoli, cauliflower, mustard, radish and watercress. These are also known as brassica vegetables, and contain natural sulfur-containing compounds known as glucosinolates. These chemicals have been shown to block the formation of tumors in the digestive tract, and are also beneficial for lung, breast and prostate cancer. Another category of vegetables is tubers, which are potatoes and sweet potatoes. These vegetables are high in Vitamin C and sweet potatoes contain the highest beta carotene content of any other vegetable. Most of the nutrients in potatoes are just under the skin so don't peel them. Root vegetables include carrots, turnips, parsnips and beets. These are packed with fiber and other essential nutrients, and should be consumed on a regular basis. The squash family, including zucchini/courgette, pumpkin and butternut squash, are all vegetables that contain Vitamin C as well as Beta-carotene, folate, and fiber. These nutrients make squashes useful in preventing cancers, heart disease, and diseases of inflammation such as arthritis and asthma. The lily family (onions, leeks and garlic), are versatile vegetables that help to enhance the flavor of other foods, and provide benefits when eaten both raw or cooked. They contain concentrated sulfur compounds, making them useful in treating cancer, as well as carotenoids, B vitamins, Vitamin C, calcium and magnesium. They are universally known for their antibacterial and blood-protecting properties. The nightshade family of vegetables includes tomatoes, eggplant/aubergine and peppers. These vegetables have a high Vitamin C content, particularly red peppers and sun-ripened tomatoes. They also contain carotenoids, B vitamins, potassium and magnesium. These foods have been found to aid in the digestion of fatty, dense proteins, like those found in meat and dairy products. Howver, this combination of foods also depletes calcium and other minerals from the bones, joints and teeth, weakening them. Some people are also sensitive to the nightshade vegetables, so these foods should be eaten on a regular basis but not to excess. Whilst it is important to include plenty of raw food in the diet, some vegetables are best eaten cooked. For example, cabbage, broccoli, Brussels sprouts and kale contain chemicals (called goitrogens) that block the production of thyroid hormone. Beet greens, spinach and chard contain oxalic acid that blocks calcium and iron absorption and irritates the mouth and intestinal tract. Raw potatoes contain substances called hemagglutinins that disrupt the proper function of red blood cells. Cooking destroys or neutralizes these harmful substances, as does the fermentation process. Spinach and cabbage are common salad vegetables but should be eaten raw only occasionally. Steaming is the best way to cook most vegetables. This preserves most vitamins and minerals, and many enzymes as well, if they are not steamed for too long. Light sautéing in butter, olive oil or coconut oil is another beneficial cooking method. Some research indicates that cooking foods in fats and oils actually makes more nutrients available. The fat-soluble vitamins in butter need to be present for the body to fully utilize minerals in plant foods. Other methods include blanching, which involves adding the vegetables to boiling water and cooking rapidly for a few minutes until tender, then draining and rinsing them in cold water. This preserves the bright color of vegetables and is especially effective for cooking green beans. Many fresh vegetables are now available all year round, and few of them require much time to prepare, and most need very little time to cook. 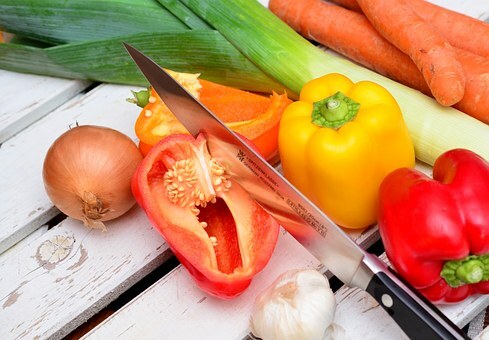 Therefore, adding a range of vegetables to meals is a quick, easy and relatively inexpensive way of boosting health and protecting against disease.